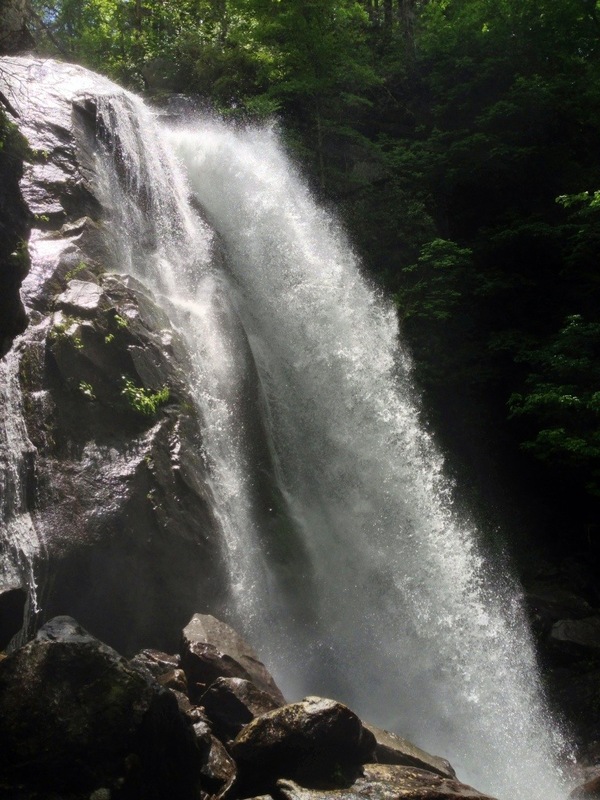 This spring has been a busy one….I have not been on a hike since late April. I had some free time this second Saturday in June. As I pondered a place to go, it dawned on me that I had not been to South Mountain State Park in over a year and a half. 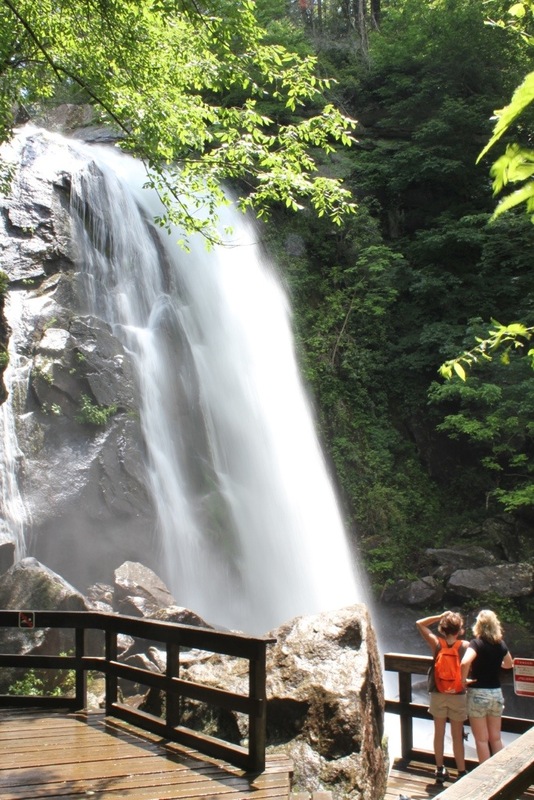 With all of the rains that just blew through from tropical storm Andrea, I had high hopes of some excellent waterfall views. 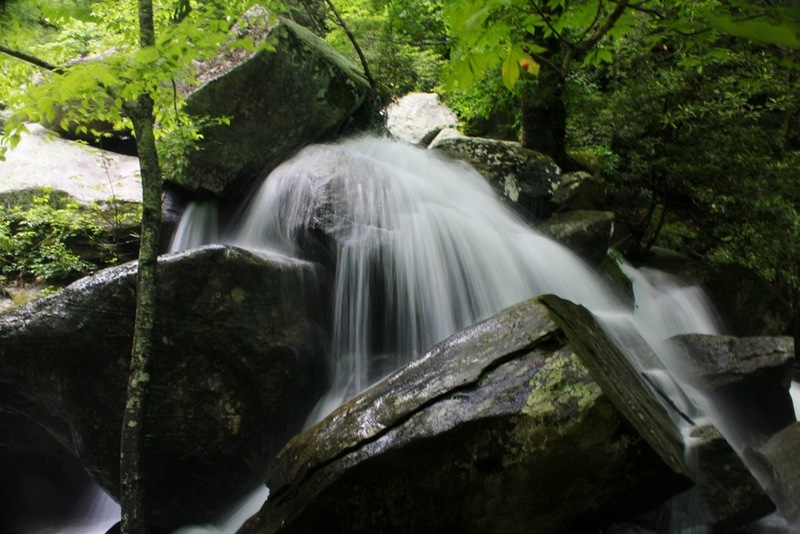 The South Mountains are their own small mountain range, cut off from the larger Blue Ridge, Black, and Smoky Mountains just to the north and west. Elevation in SMSP reach a peak of about 3000 feet at the Buzzards Roost Tower. 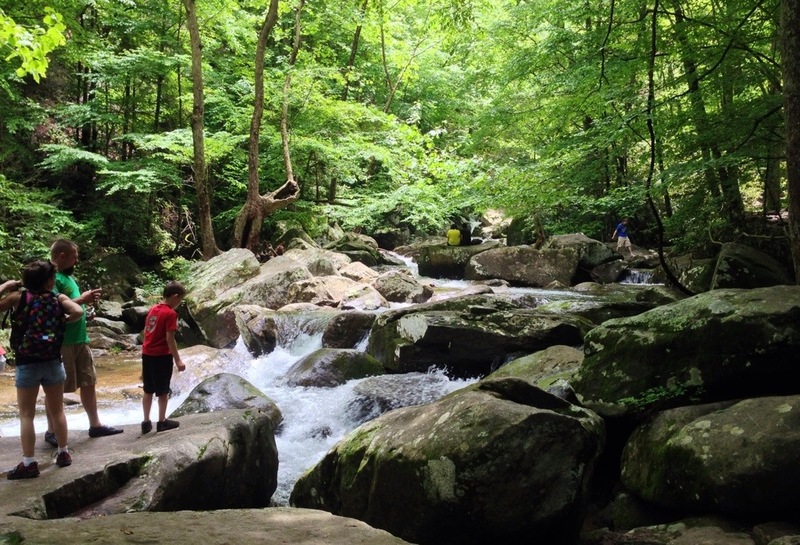 The State Park is very large, rugged, and still largely undeveloped. 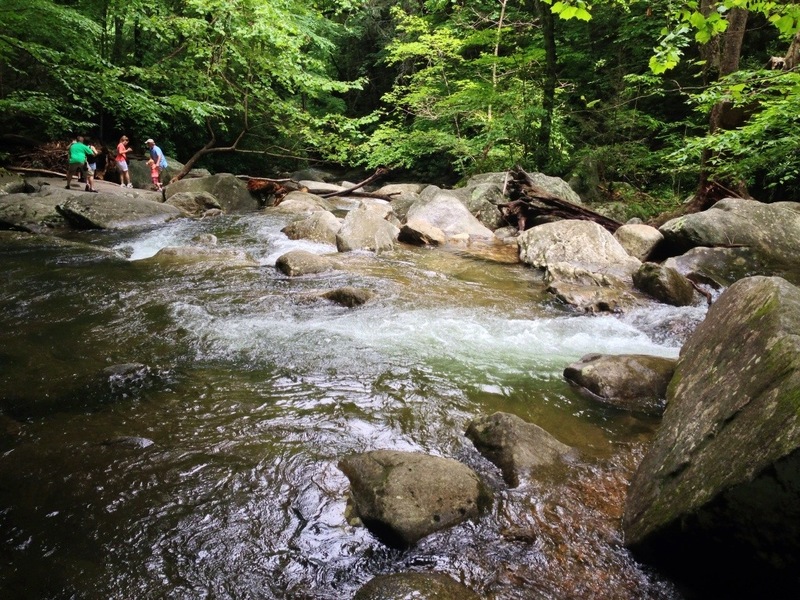 There are though over 45 miles of trails for hikers, biking and equestrian. 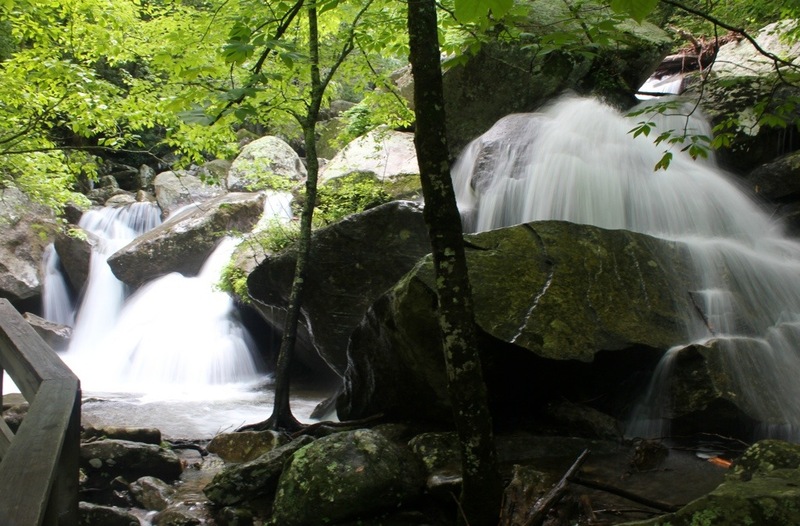 The most popular trail, by a long shot is the High Shoals Falls Loop Trail. This can be reached by driving past the very nice visitor center, all the way until the road ends, several miles or so. At the parking lot is some nice picnic areas, a ranger station, and numerous trail heads going all kinds of directions. 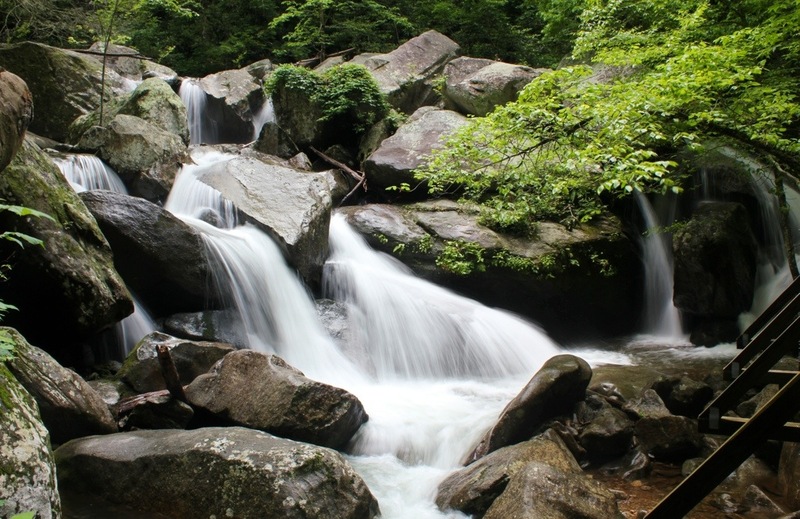 The Jacob Fork River flows right through here as well and will be the main attraction of this hike. 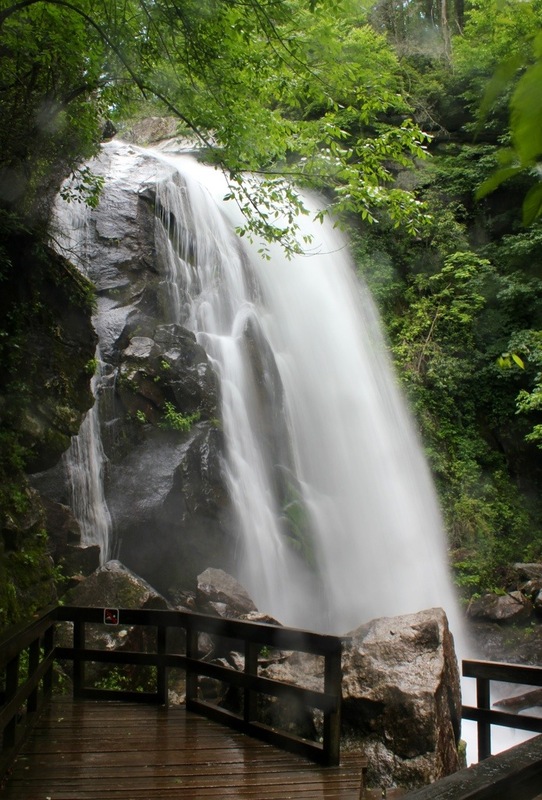 It is a beautiful, and clear river with many rapids, a few cascades and a very nice big waterfall. 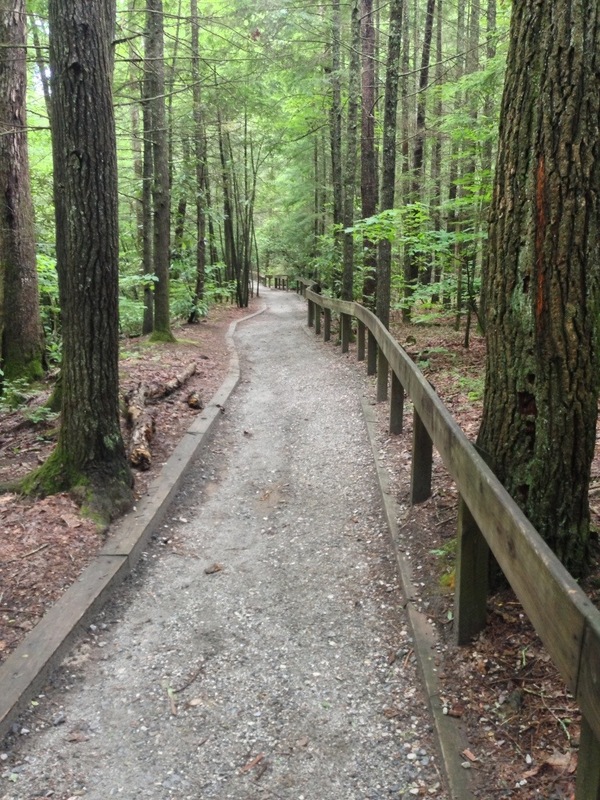 To begin, we start with the Hemlock Nature Trail. 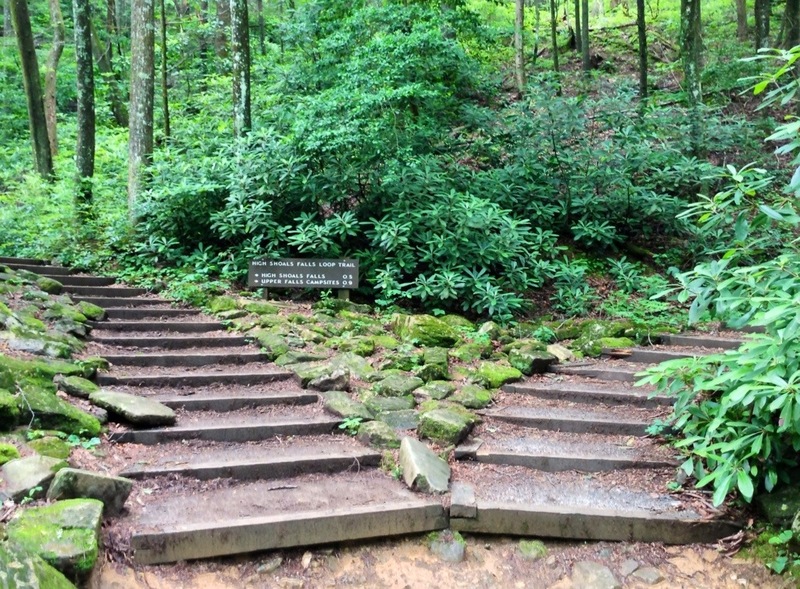 The High Shoals Falls Loop Trail begins at the parking lot. 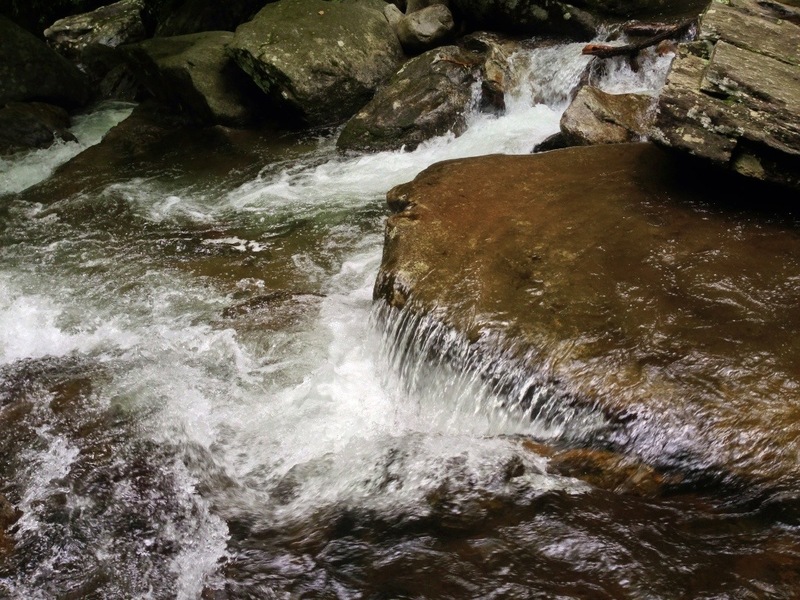 There is a shorter 0.3 mile Hemlock nature trail that runs right along it, just closer to the Jacob Fork River. It is more scenic, with wooden docks and informative displays, so I took it until it runs back into the Loop Trail. 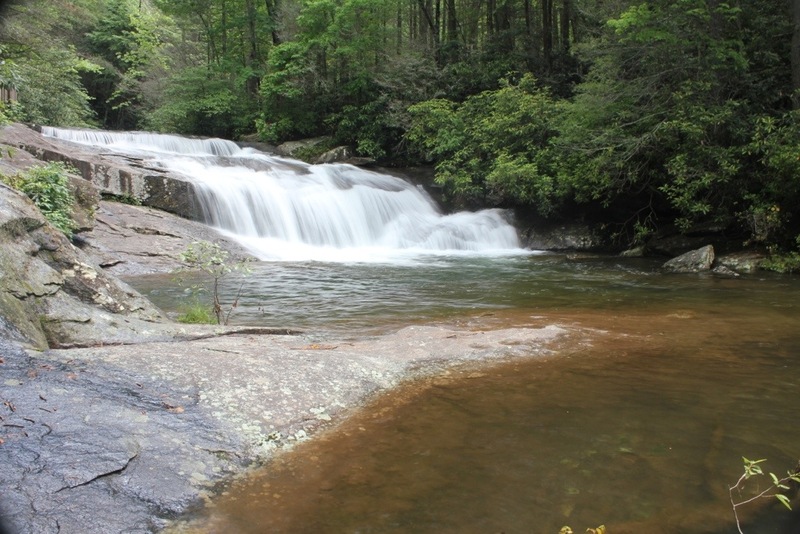 High Shoals Falls is 1 mile from the parking area and the first half is totally flat and largely uneventful. When you arrive at the split…..take the trail that goes left. This is where all the goodies are. 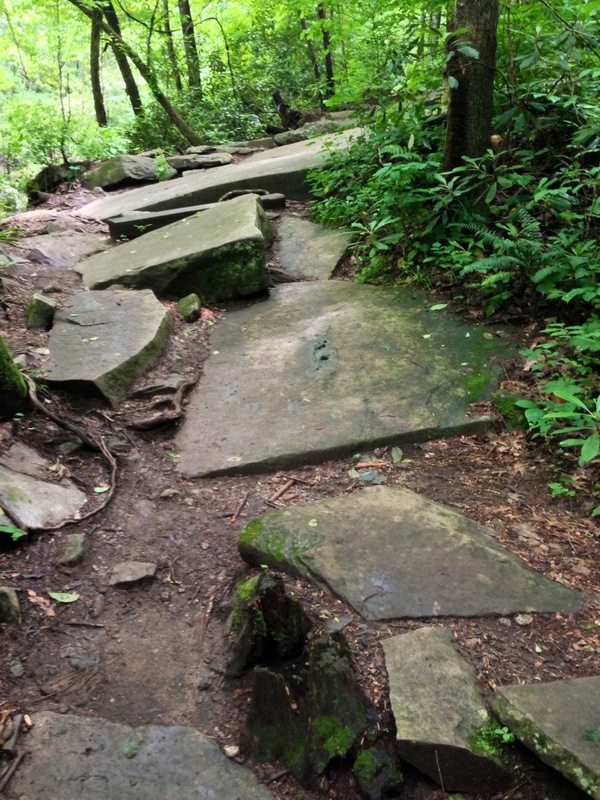 Once the trail splits, the nature of the trail also changes. 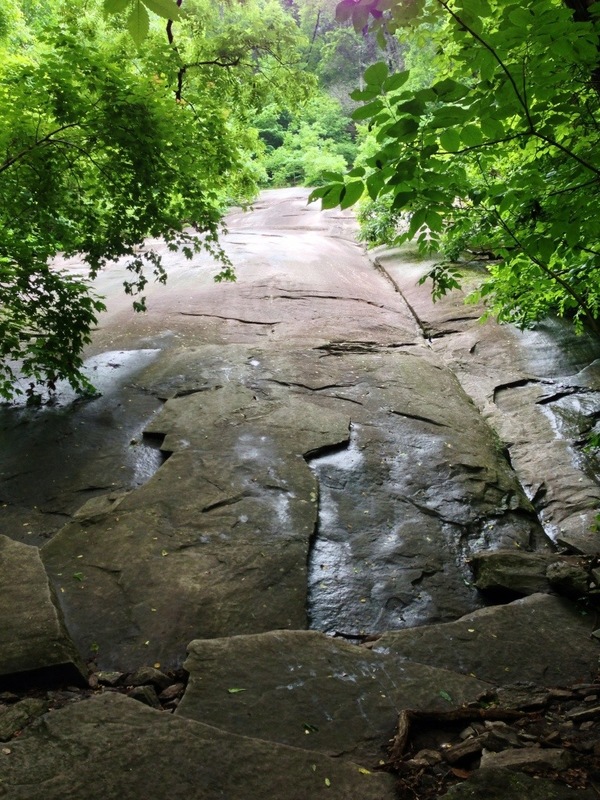 Instead of a gravel road, it is now a bumpy trail full of rocks and boulders. It begins to climb as well, just not too steeply…yet. There comes a spot where some strange and large rocks must be maneuvered. These are the remnants of a large rock slide caused by the heavy rains and floods of Hurricane Hugo in 1989. Looking up to the right here is a steep sloping rock face that goes up several hundred feet. Do not attempt to climb this. Walking along, there are many places to stop and play in the water if you wish. There was quite a bit of this happening today, as the sun pushed the temps to about 80. Then comes the bridge……this is a spot where the Jacob Fork River completes its dramatic series of drops, falls, and cascades. Here at the bottom, the river has widened considerably with lots of little cascades and “mini-falls” popping out everywhere. It is truly a beautiful scene here. 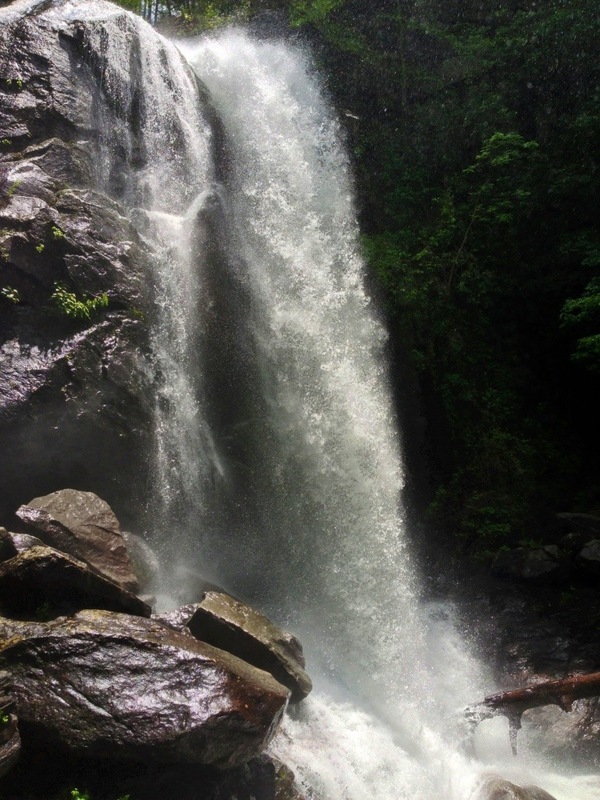 I am torn as to whether I like this spot better or the bigger falls at the top. It is a tough one. Looking way up from the bridge, High Shoals Falls can just barely be seen. 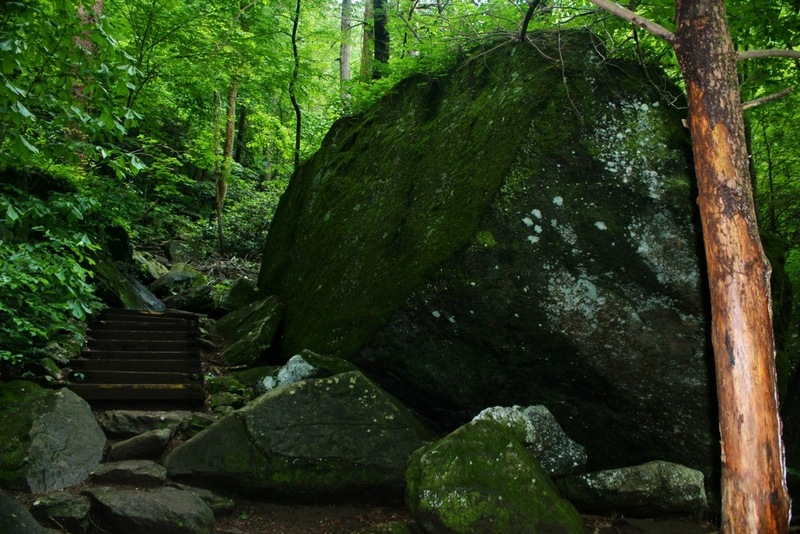 It is way up there in a steep gorge, and by the time the next 1/4 mile is hiked, your body and legs will know it. Once across the bridge the trail that was easy to moderate to this point becomes strenuous. 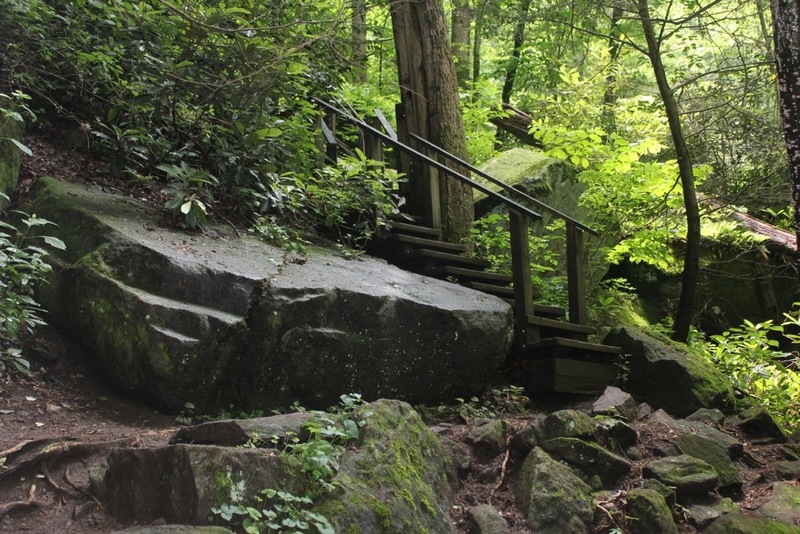 Through a series of rock and steep wooden staircases, the remaining trail to the waterfalls are tough, short and very rewarding. 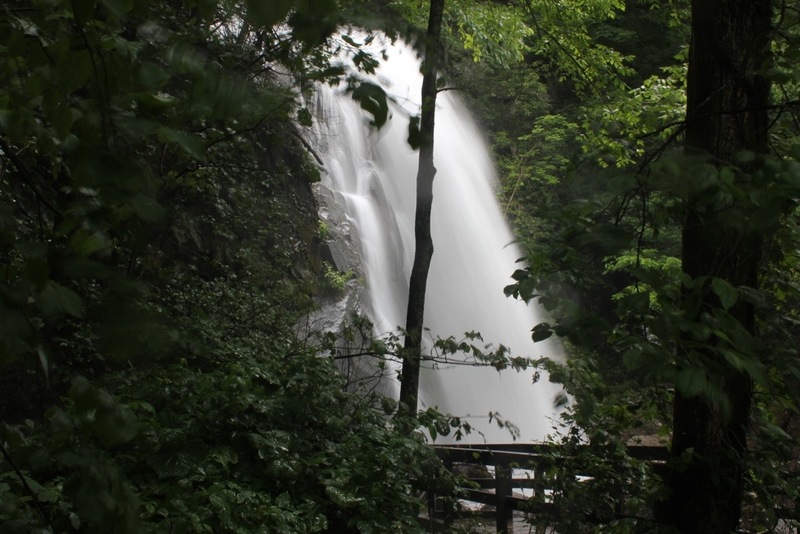 The first one here that greets you is High Shoals Falls. It is listed at 80 feet, I have read several reports that is more like 50. Either way it is beautiful. 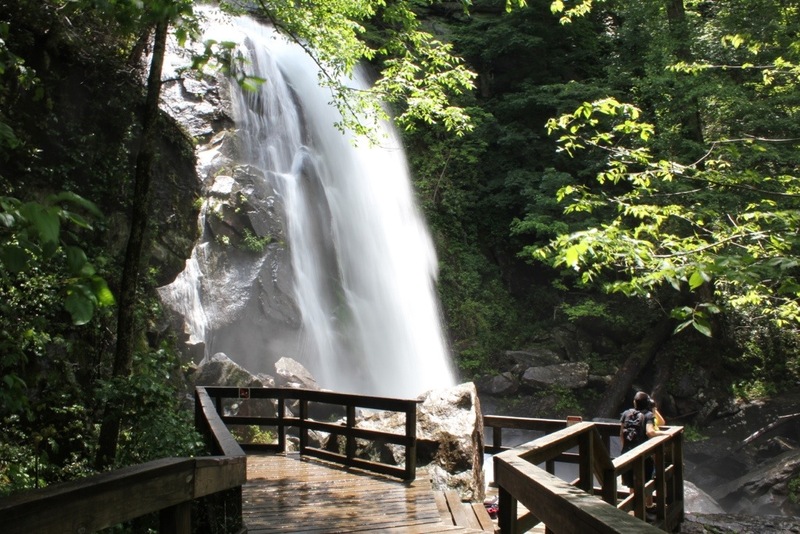 There is a very well built and well placed wooden observation deck just to the left of the falls. With the water flowing like it was today, standing on the deck was enough for a soaking. 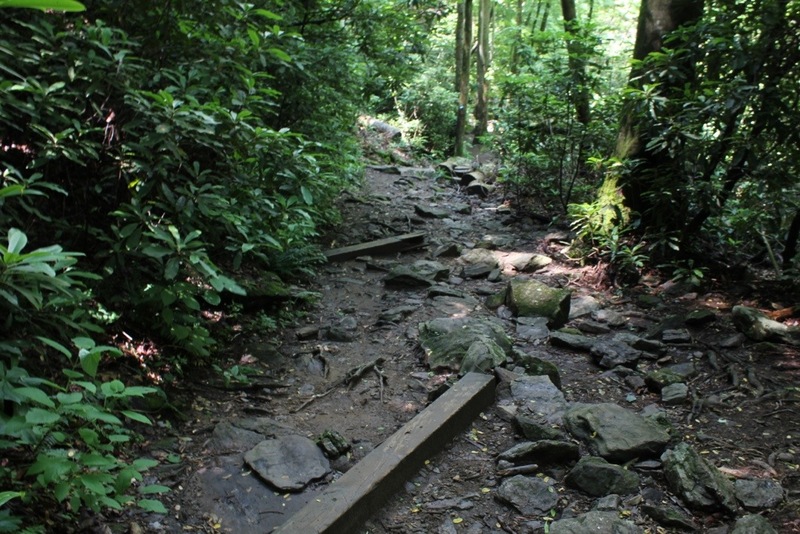 Most people head back after this, but it is a loop trail. If you have a little more gas in the tank, more goodies await. 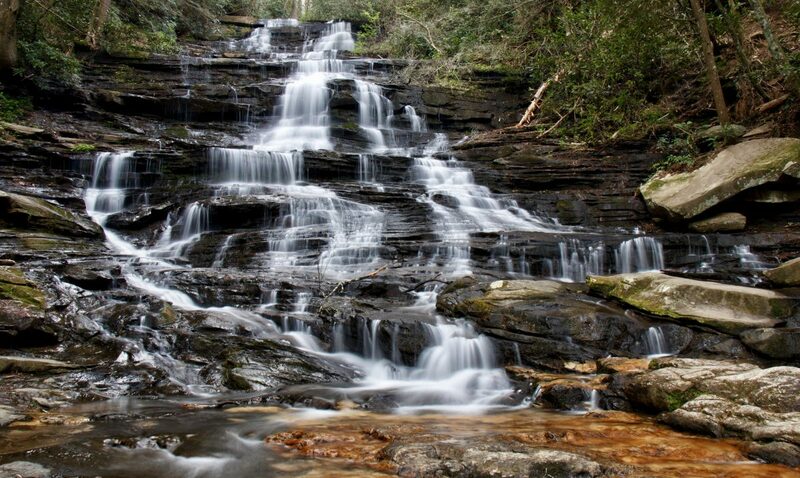 There are more steep steps to climb, but just past the top of High Shoals Falls are another set of falls. 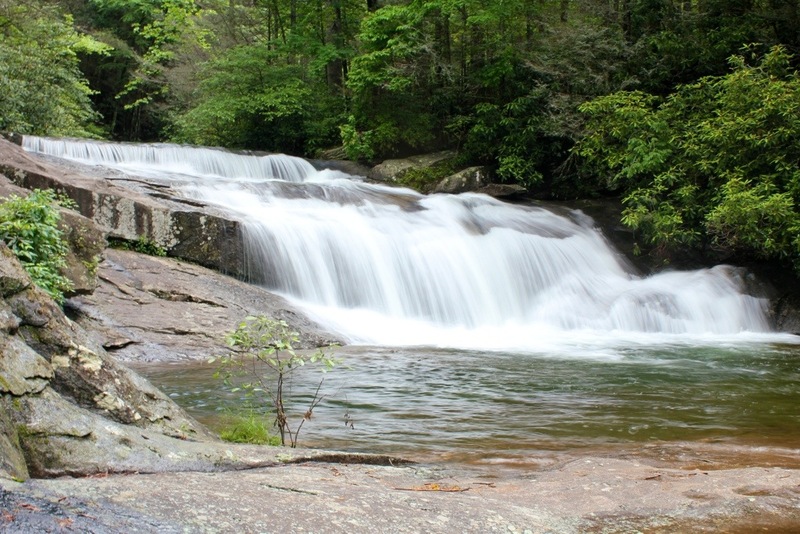 I have seen that this is considered part of High Shoals Falls by some, and Upper Falls by some. I like to call it Upper Falls as well. 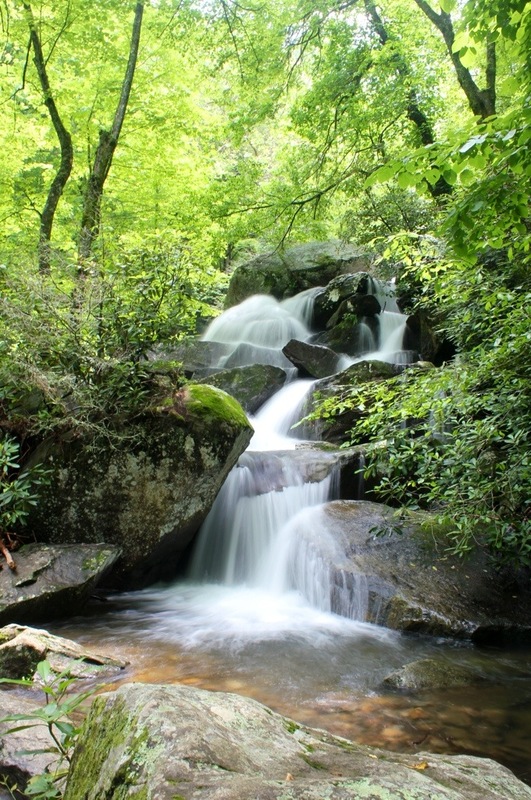 It is a beautiful, smaller set of falls that deserves to be recognized and distinguished. At this point, the trail crosses the river again and climbs for a short distance, only to begin a longer, more gradual descent back to complete the loop. I have done it a number of times, and it is much less scenic. On this day, I turned around and went back the way I came, just for another shot at the falls. 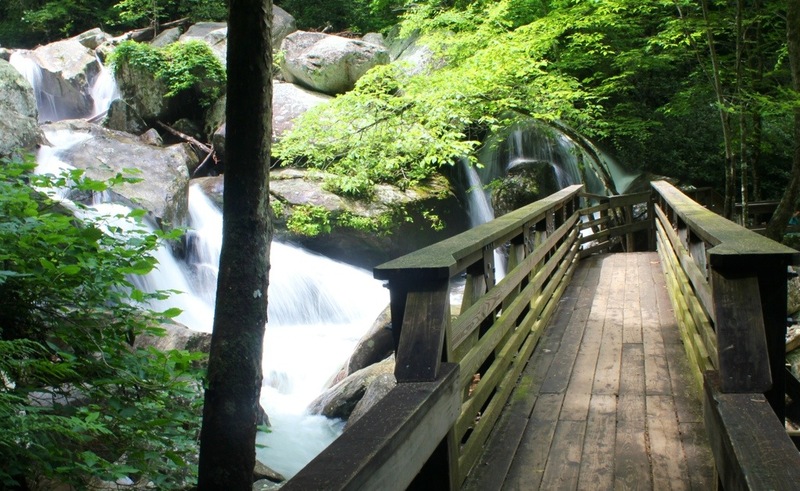 There are a number of other good trails here to hike, but this one is by far the most scenic and popular.